The worst step for getting better at anything is questioning why you’ve bothered getting where I am thusfar. 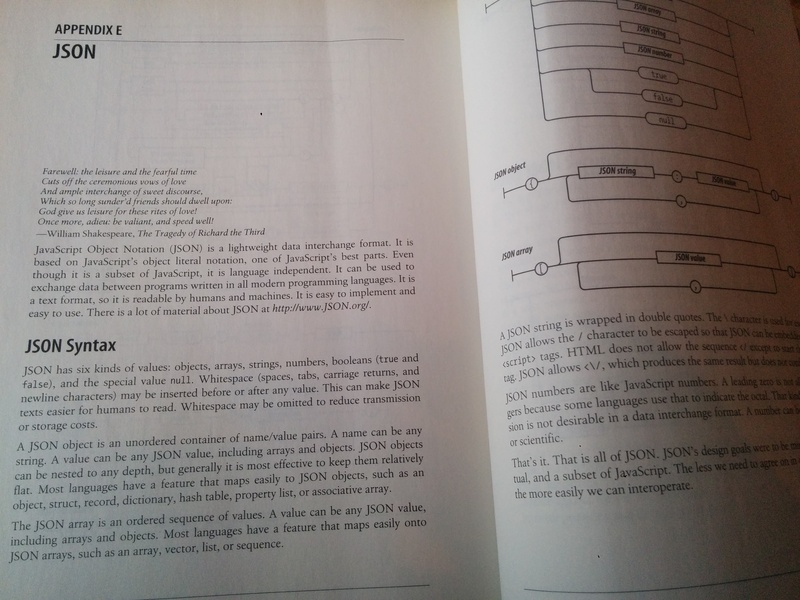 “Screw the internet, I should take up burger flipping” sounds totally reasonable as I pound my face into programming books. Every Monday, Spotify creates a playlist for you with music they think you’ll like. It’s called “Discover Weekly.” It can be hit or miss – but I usually give it a shot at least once during the week. This week it did not disappoint. I recognized the song, but not immediately. I was used to it not with words and digital harmonies but with a brassline. It was the Bluecoats’ ballad in their 2014 show, Tilt. I had no idea this was originally a song with lyrics. And as I heard the true meaning of the song for the first time I was pulled in. Acxiom is a provider of marketing software. They do a lot of stuff, and having experience in the industry I don’t want to over-generalize the pros and cons of them or their competitors. But let’s say they have a lot more to gain from your lack of privacy than they do defending it. “Hymn of Acxiom” presents a dystopian farce; a religious rite of a company tracking and manipulating people. Imagine if 1984 was written from the perspective that Big Brother really was just the best. Vienna Teng performs the song live and explains its origins in this video. The song has been my work soundtrack for the week. I’ve been known to listen to songs on a loop before and this one really fit my mood. In past jobs I basically sold people’s information to companies, a part of the internet I really hate. My day to day now lets me fight on the right team: advancing an open web, advocating for both transparency and privacy where both are needed. Open registration for new .blog domains begins on November 21st, but you can apply early today at get.blog. In November when it’s all up-and-running you’ll see this very site move over to a .blog domain! … unless someone else wanted to get me a present! Recently I hit a cool benchmark of 10,000 points on the technology education website, Treehouse. I really like what they offer and really owe a lot of my career to them. I guarantee you, without learning what I’ve learned from them I never would’ve been hired at Automattic. 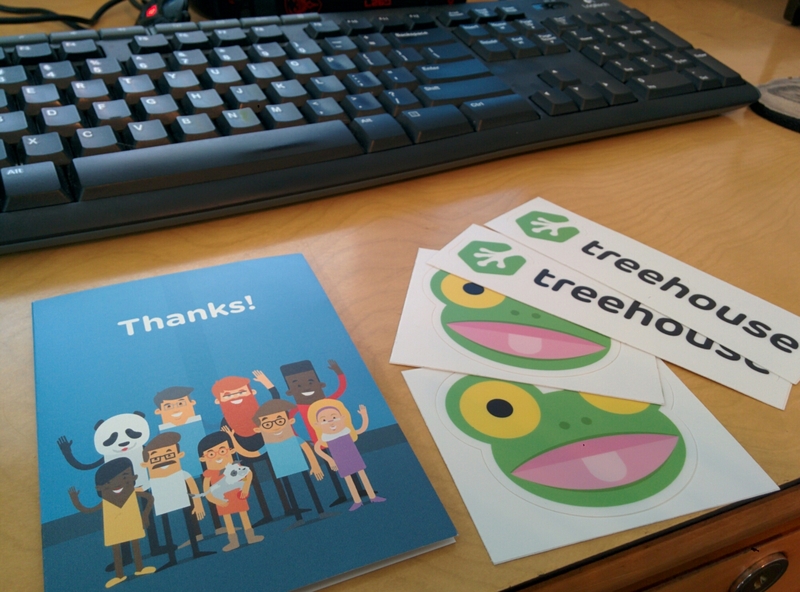 In celebration of those points, I decided I needed to get some Treehouse stickers on my laptop. I remembered they had a swag store up at one point, but they took it down. Not to be deterred, I emailed their support team and they offered to send me some stickers to celebrate the occasion. They also added a cool “Thanks!” card with a hand-written note inside! 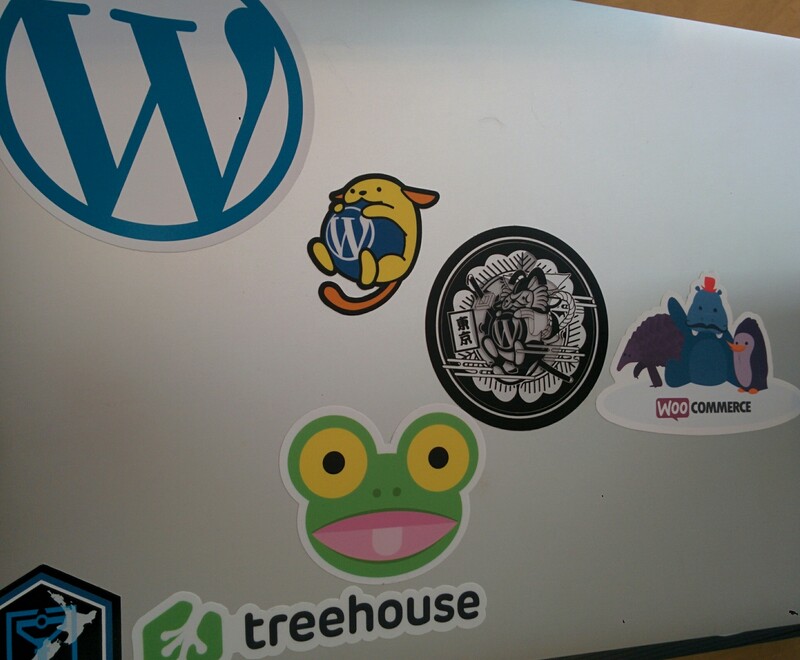 Mike the Frog now gets to chill along with Wapuu and friends on my laptop.